I bought this for my younger brother as a present but was so intrigued to see how Riordan would bring the Greek Gods into the modern day, that I decided to give it a go myself. There’s no faffing about, it’s all in-your-face-action with an easy going, humorous narrative from Percy himself. With his natural way of speaking and everyday problems (on top of the extraordinary problems you get from having a God for a father), I imagine kids can relate to Percy. Unfortunately it didn’t take many chapters for me to get weary of the book. I still enjoyed some of the one-liners, (“wouldn’t that put a twist in your toga?”) but I soon started to find flaws in the characters, the plot and in fact the whole world that Riordan has created. All of the way through, I could not help but compare it to a book aimed at a similar age; Harry Potter. I have always loved Harry Potter, but I don’t think I ever appreciated just how well written the series actually is. J. K. Rowling’s world of wizards has been so well thought through. The detail is fantastic. On the whole, it is very consistent, whereas I was constantly irritated by Percy’s world. There were a number of times where I thought, what a coincidence that such and such a monster lives right here, where Percy and his friends are stopping for a bite to eat! Although I didn’t necessarily enjoy all of this book, I can still see how it could appeal to children, and children reading can never be a bad thing! 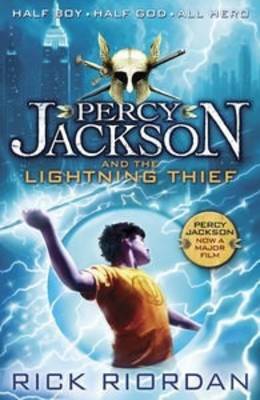 Especially when it introduces them to the Greek Gods – who knows, children reading Percy Jackson today might pick up The Iliad in the future because they liked the series. Although they may be shocked to learn that Zeus never wore a pin striped suit! Not my cup of tea, but possibly a present for superhero, action adventure loving kid! Click on the picture below to buy a copy! I have wondered about this series. Not sure if I’ll try it myself. And I wish I could have vaporized my geometry teacher. I hated geometry. This series is so popular, there’s even a film (although my younger brother assures me that it’s nowhere near as good as the book!) but it just didn’t do it for me. I don’t think it’s just because I’m not a child, because I do still really love some children’s books that I read!